Many of us will be familiar with diminutive Crocus tomassinianus, which pops up through lawns and borders in early spring, leaping from the sward like flames from a gas hob. The species seeds itself freely, but is easily trounced by heavy weather. 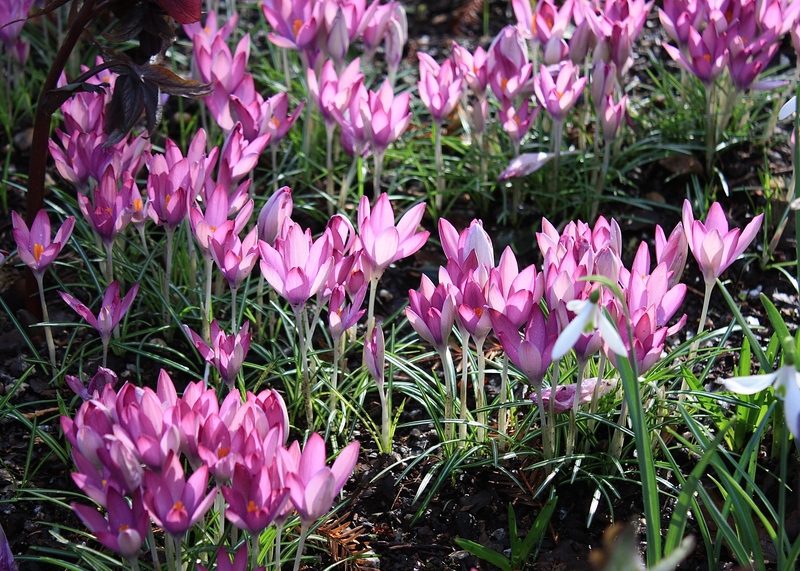 This weekend I’ve been introduced to a more robust pink form, Crocus tomassinianus ‘Roseus’. The flower buds emerge pale and cadaverous from clumps of needle-like leaves. They open a tingling rose-pink, contrasted by saffron-orange stamens and white stems. Delicate petals are rendered translucent by the winter sun, as here at Bosvigo. The effect en masse is sensational. Combine with burgundy-red hellebores or black-leaved Ophiopogon planiscapus ‘Nigrescens’ for high drama. I’m pleased you felt it too! I love these little species crocus and ‘roseus’ is such a lovely colour. I am with Reginald Farrer who thought that Dutch crocuses are ‘fat, bloated things that have lost all the brilliance and grace of the wild species’. Tomassinianus crocuses seed around in such a delightful way too. You (and Reginald) have a point, although I find it hard to dislike any flower. My mother used to tell me a story that involved a purple, yellow and white Dutch crocus, so I still feel slightly sentimental about them. They don’t find a place in my garden, but they do lift my spirits when I see them pushing up through the grass. What a lovely colour and beautifully photographed. I must look for these for my garden.